“Community Service and Development Unit” includes professors and teaching assistants who are in charge of developing the social and cultural activities and awareness. The Unit team measures the satisfaction of the participants through surveys analysis in order to identify the opportunities for improvement. The CMT has previously carried out many social responsibility activities and events. •	Protection of health and environment. In addition it serves community in various aspects such as health & safety, culture, public awareness, sports in addition to philanthropy. CMT provides different facilities to those students, such as awarding a full scholarship, providing tutors, guiding them in classes. Disabled students: preparing a specialized center equipped with all the required equipment that satisfies their needs. 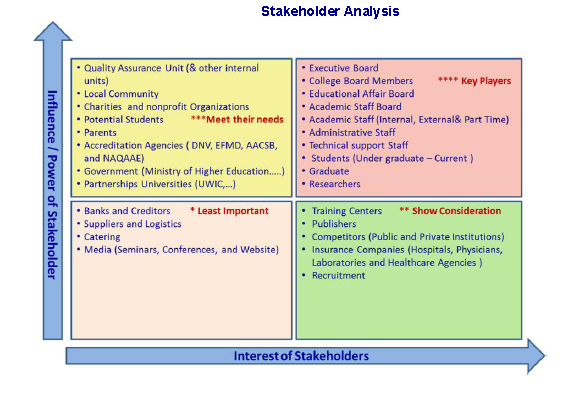 •	Methodology of stakeholder prioritization and mapping based on the two criteria of Influence and interest. •	CMT has been already engaging with its stakeholders through various methods. •	Engagement with key stakeholders was on a regular and planned basis through meetings, seminars workshops and reports. •	Enhance communication between pilot organizations on a local and regional level. •	This could be achieved through organizing more SR seminars. •	Awarding the letter of recognition on an international level will increase the commitment of the participated organization. This will also motivate the participation of more organizations to be sociable responsible.